Ranger Lifting has modified a vacuum below-the-hook attachment for installation of key elements, as a large railway project enters a key phase. 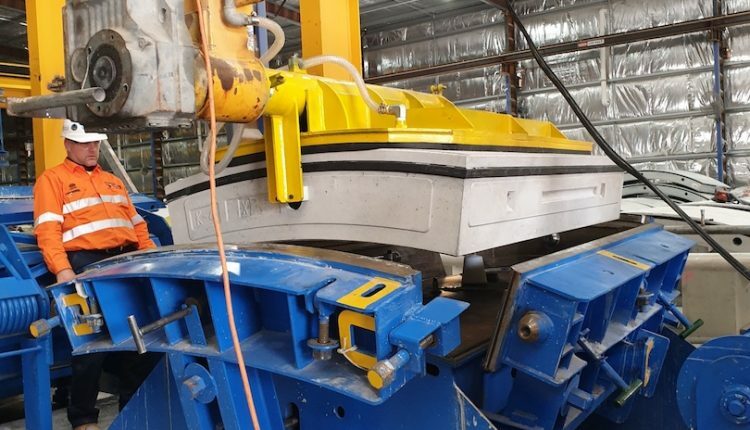 Prestons, Sydney-based Ranger, a specialist supplier of lifting and rigging equipment, has adapted the Acimex vacuum lifter, manufactured in France, to meet specific requirements for installing 1,000 elements over a two-year period, as a tunnel boring machine (TBM) is prepared for work. Leo Giuntini, business development manager at Ranger, explained that the elements are thicker than the standard units used elsewhere because of the soil environment along the boring route. The attachment will work with a 3t capacity, 44m-long, freestanding monorail hoist that originally had a working load limit (WLL) of 900kg, increased by Ranger to 1,350kg. Additionally, Ranger has changed the orientation of the vacuum head 90 degrees and lengthened the support bar. Acimex manufactures all types of vacuum lifters for gripping bulky concrete, steel, or PVC parts, but the adaptation of this model once again demonstrated Ranger’s ability to tailor a solution for a specific project. The solution represented a significant time and cost saving for the customer, as the alternative to customising the existing product would have been to source a new one from France. Upon consultation with the end user and a local engineering firm, Giuntini was able to oversee the modernisation project that delivered a suitable solution to the client. As required under Australian Standard AS 4991-2004, the new product, operated by hand grips, had to receive third-party verification and was proof loaded to 110% of the WLL. A larger vacuum pump was also fitted for the extra capacity. Ranger is frequently engaged in tunnels projects, above and below the ground. Whether it be the installation of jib cranes at the surface for emergency rescue or the provision of ratchet lever hoists and rigging for use many metres below, it is always important that equipment stands up to the rigours of the sector and meets the demands of one of the toughest environments there is.